I rarely hear an entire record played on the radio. A few months ago, I heard the album Eskimo by the Residents played on WXDU’s stellar Sunday afternoon show, Polyphonic Perversity. I soon purchased it and have really enjoyed hanging out with it since. I know very little about the Residents, so I won’t say too much about the album as it fits into their discography or musical peers. What I will say about the album is that it’s perhaps the only record I’ve ever heard that made me think of a museum rather than about other records or musical performances. The museum it made me think of is the Museum of Jurrasic Technology in Culver City, California. I went there for the first time in 1996. I remember a sun drenched day walking along a typical-for-LA unremarkable commercial stretch of Venice Boulevard. Suddenly my friend Mark, who lived in Venice and was showing me around town, led us through a doorway. We ducked into a dark lair that it took several minutes for my eyes to adjust to. The experience of that contrast was part of the impact the museum made on me, part of how it dislocated me from the immediate environment of Greater Los Angeles. In that regard, it reminded me of how many of my favorite locations in LA feel like intimate secrets that carve out a niche for themselves in a town known as the engine room of the bombastic images and sounds that are produced by mainstream American culture. One minute you’re driving past the set of Wheel of Fortune, next you’re ducking into… a museum sized art installation that parodies and mocks western anthropology. I grew up in Cambridge MA, home of the Peabody Museum, an anthropological bastion at Harvard University that is exactly the kind of institution that the MJT sends up with great subtlety and subversion. I spend a lot of time at the Peabody when I was very young because my father worked part time on the papers of the recently retired Harvard anthropologist Cora DuBois to earn extra dough to supplement his high school teaching position. I remember running around her house and the museum while he sifted through her archives and wrote letters for her. Cora was a remarkable woman. She was the second woman to receive tenure at Harvard, and began a lifelong partnership with Jeanne Taylor long before the gay liberation movement, during World War II. They met while they were both working for the Office of Strategic Services, the precursor to the CIA, in Sri Lanka. She did intelligence work for the State Department for five years after the war. In 1950, she declined an offer to become head of the anthropology department at UC Berkeley because she refused to sign the anti-communist California Loyalty Oath that was required of faculty members at that time, in the days of Senator McCarthy’s House Committee on Un-American activities. So too, apparently, are the Residents. The liner notes of the original album claims that the record is an authentic document of the musical style and cultures of the indigenous Inuit people of the arctic circle. Similar claims of authenticity were made by some of the exhibits I saw 18 years ago at the Museum of Jurrasic Technology, which included a memorable Peabody-museum style diorama about a species of bats a Western scientist had gone to study in the Amazon jungle because of their ability to fly through solid objects. Just as the diagram of a maze of lead walls constructed to test these bats at the MJT awakened me to the satirical nature of that project, the synthesized windscapes that open the first track of the Eskimo album, The Walrus Hunt, come close enough to mimesis to make you wonder if they’re recorded in the field, at the same time as the brittle disintegration of the synthesized sound waves let you know that they were not. Voices that supposedly belong to Inuit people dominate throughout the album. They are in reality gibberish. What they do capture is the way precolonial non-romance languages sound on records I sought out when young such as the Smithsonian Folkways album Lowland Tribes of Ecuador. 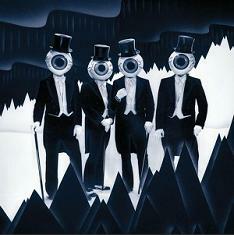 The Residents display a mastery of the tricks used to frame precolonial and preindustrial indigenous groups in Western intellectual settings like Harvard’s Peabody Museum, and by record labels like Folkways, or more recently, Sublime Frequencies and Dust to Digital. These sources combine a genuine love for and interest in distant cultures with inevitable complicity in a power relationship between metropole and colony that is fundamentally destructive in its impact on the people being held up for aesthetic and intellectual curiosity. The self-reflexive French anthropologist Claude Levi-Strauss once wrote that every attempt we make to understand an object of study destroys the object itself. For an excellent article about how this process unfolds with respect to the reception of the music of Omar Souleyman in the west via Sublime Frequencies, check out this piece from the great online magazine Jadaliyya. In that respect, the paradigm of Love and Theft Eric Lott has used to describe the relationship of white American working class people to black music holds true in the less popular and remunerative but still culturally important intellectual/avant-garde context. With the popularity of sample libraries and virtual instruments, sounds of precolonial societies are becoming a greater part of the fabric of popular western music as well in the hands of producers like Timbalaand. I’ve read several books within the last 8 years, like Palestinian Walks, Siam Mapped, and Imperial Eyes, that helped me understand how anthropological and geographical research have served as scouts for conquering Western armies prior to their invasions. The knowledge accumulated tells them where the natural resources are, and who must be dealt with – or disposed of – in order to extract them. Today in the democratic nation that the Enlightenment wrought, research continues apace on far flung corners of the globe. The Ecuador I heard about through Folkways and the Arctic Circle I hear about now from the Residents are both important locations on the strategic global map of the fossil fuel Industry. Ecuador is the third largest supplier of oil in South America to the US after Venezuela and Brazil. Chevron has been embroiled in a back and forth lawsuit over its practices in Ecuador’s portion of the Amazon Rainforest for quite some time. Last March, a US judge ruled they did not have to pay a 9 billion dollar judgment that went against them in 2011 after they were sued by indigenous groups. More recently, the lawyer for the indigenous groups dropped the case and paid Chevron 15 million dollars under pressure. Chevron has also pressured CBS to drop coverage that was critical of their actions in the case. Ecuador has also seen internal debates over oil extraction in the last part of the country where indigenous people live in voluntary isolation. President Correa, like other left learning leaders such as Evo Morales of Bolivia and the late Hugo Chavez of Venezuela, has been targeted by protests by environmental and indigenous groups despite his departure from Washington’s sphere of influence. Drilling for oil in the arctic circle has been a political football that has reached near-iconic status in electoral politics in the United States, perhaps most famously in the symbolic value of John McCain’s choice of Sarah Palin as his running mate for the 2008 election. Naomi Klein once analyzed the electoral fanfare surrounding Palin’s pro-drilling stance as Governor of Alaska – “Drill, baby drill!” – as a promise of an infinitely forgiving maternal forebearance on the part of Mother Earth herself. No matter how much of a mess the men who run the oil industry make of the world, the climate can take the abuse and still provide for us. “Inuit Circumpolar Council (ICC) – Greenland and WWF World Wildlife Fund have signed a collaboration project and has received a grant from the Villum Foundation to work with mining activities and public involvement in Greenland. The project will run over a two year period from September 2012 to September 2014. The picture below suggests a milieu that has little to nothing to do with the Residents’ depiction of life in the Arctic. But then again, maybe the Residents weren’t really singing about the Inuit, but about our idea of them, and of others within our imperial sphere of influence. I don’t think that debates over arctic drilling held center stage in the political discourse of the time the Eskimo album was recorded, (from 1976 to 1979.) But I do think that the encroachment of western commercial enterprise on various regions and peoples was on the Residents minds when they made it. The AllMusic review claims one of the indigenous chants on the album is actually “Coca Cola is Life.” Coca Cola is the second most understood phrase on the planet, after OK. The Residents, decked out in their tuxedos, top hats, and walking sticks as they straddle a representation of the arctic landscape, sing about how that phrase got planted on so many lips, in so many places. Their anonymity and eyeball masks keep your attention on that topic, preventing fantasy-driven speculation and gossip about the personalities of the musicians themselves. 27 Oct	This entry was published on October 27, 2014 at 12:45 am. It’s filed under Book excerpts, Book Reviews, History, Record Reviews, Work In Progress and tagged american empire, Arctic Circle, Book Reviews, Coca-Cola, Cora Dubois, Dust to Digital, Ecuador, Edward Said, Emmanuel Chukwudi Eze, Eric Lott, Eskimo, Folkways, Harvard University, History, Immanuel Kant, Imperial Eyes, Imperialism, Indigenous Peoples, Inuit, Jadaliyaa, Jay-Z, LA, Left media, Lowland Tribes of Ecuador, Museum of Jurassic Technology, Music, Naomi Klein, Native Instruments, Omar Souleyman, Palestinian Walks, Paul Gilroy, Peabody Museum, Race, Record Reviews, Residents, Sarah Palin, Siam Mapped, Sublime Frequencies, Timbalaand, Upcoming Projects. Bookmark the permalink. Follow any comments here with the RSS feed for this post.